This past Wednesday a group of South Village neighbors testified again, this time at the New York City Office of Citywide Administrative Services, where they spoke out against the sweetheart deal that God’s Love We Deliver wants to pass along to Quinlan-Tavros Development at the expense of the city and the neighborhood. They also released a recent rendering of the impact of the GLWD-QT development on the neighborhood’s skyline. Outlining the history and finances of the proposed development, one Sullivan Street neighbor pointed out that GLWD received an extremely favorable deal on the original purchase price of the 166 Sixth Avenue building, paying only $535,000 for the 18,000 square foot structure in 1993. The reduced price tag came with the stipulation that the air rights be held in perpetuity for community use. Specifically, the deed noted that the air rights could not be used for commercial development. Now, these same air rights are being sold for just that: a luxury condominium and retail high-rise development. If that weren’t bad enough, GLWD is selling these air rights for less than market value to Quinlan-Tavros. The Wall Street Journal reported that GLWD will sell the valuable vertical real estate for $200-300 per square foot or for $5.5-6.5 million dollars. Comparable air rights in New York City go for $400-500 dollars per square foot, or up to $9 million dollars. Quinlan-Tavros is receiving a 30-50% discount on these air rights, saving between $3 and $4 million dollars, as GLWD passes along their sweet deal to private developers at the expense of the neighborhood and New York City’s taxpayers. Meanwhile, the City is settling for just $765,000 as their share – taxpayer’s share, our share – of this deeply discounted deal. That’s less than the asking price for a studio apartment in the proposed condominium complex. The neighbors have long known that the GLWD-QT scheme is bad for the neighborhood, which will lose sunlight at Vesuvio playground and at two other public spaces, but it seems it’s also a bad deal for all New York City taxpayers. This entry was posted in Uncategorized and tagged 180 Sixth Avenue, God's Love We Deliver, real-estate, Vesuvio Playground on February 28, 2013 by southvillageneighbors. A group of concerned South Village neighbors have banded together to challenge the proposed 15-story high-rise luxury condominium development planned by God’s Love We Deliver & QT Development at 180 Sixth Avenue. The GLWD-QT monstrosity is at the heart of the proposed South Village Historic District and will dwarf the surrounding neighborhood and leave us to live in its shadows. It is totally out of character with the low-rise, low density buildings that we have come to appreciate as being part of the charm and warmth of our beloved South Village. 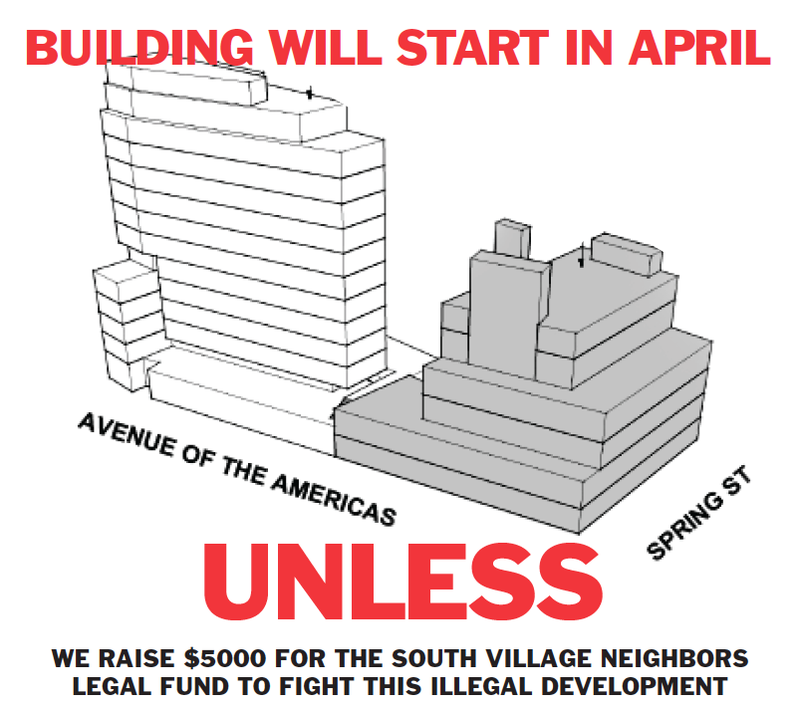 After consulting with a prominent land use attorney and zoning expert, South Village Neighbors has launched a legal fund campaign to mount a serious opposition to this latest example of overdevelopment in our neighborhood community. The goal is to raise $5,000 by the end of Valentine’s Day weekend. By standing together, we can stop, or seriously slow, the 180 Sixth Avenue overdevelopment disaster. I’m an artist. I’ve lived directly across the street from the GLWD site since l975. My wife and I have raised two children, here, and struggled mightily to create a home amidst the enormous pressures of economic and commercial hyper-development. This project is architecturally destructive to the brick-and-mortar nature of our neighborhood, and totally inconsiderate to those of us who actually live here. It is an invitation to developers far and wide to demolish our historical buildings, push us out of our homes, and allow rampant construction of ugly glass and aluminum buildings which are completely out of scale with the beautiful SoHo, which originally attracted artists and tourists. This neighborhood needs to be preserved, just as great European cities preserve their historical areas and landmarks. It is truly unfortunate that a reputable and positive charity such as God’s Love We Deliver has chosen to act as a stalking horse for some of the worst forces in our city. Our overburdened and outdated infrastructure and electrical grid can barely support current demands without adding more overdeveloped properties. We have enough new luxury condo space in the neighborhood which remains vacant. Unrestricted development is destroying quality of life for millions of New York City residents. There is no sense of balance. New construction of residential and office space continues unabated with NO corresponding improvements to infrastructure to accommodate increasing numbers of residents and workers. In addition, the asethetics of entire neighborhoods are being destroyed with little or no concern for longtime residents or small business owners. For lack of a better word, I am disgusted and my vote in the upcoming Mayoral primary will reflect that disgust! Show God’s Love and QT what real neighborhood love looks like. Make a Valentine’s Day Legal Fund contribution today. 1. Make a check to SoHo Alliance for $500, $300, $250, $100 or whatever you can afford (no contribution is too small). 2. Note “South Village Legal Fund” in the memo line. New York, NY 10012 1. Visit http://www.sohoalliance.org/join.html. 2. Enter the amount you’d like to donate and click on “Pay Pal”. 3. Just before you pay you will have the opportunity to designate your donation for the legal fund. When you see the “Your order summary” page, enter “South Village Legal Fund” in the box for description. This will earmark your donation for 180 Sixth Avenue challenge. Many thanks to SoHo Alliance, and their Executive Director Sean Sweeney, for agreeing to serve as a fiscal sponsor for the South Village Neighbors Legal Fund. This entry was posted in News Coverage and tagged 180 Sixth Avenue, God's Love We Deliver, legal fund on February 16, 2013 by southvillageneighbors. This entry was posted in News Coverage and tagged 180 Sixth Avenue, Community Board 2, God's Love We Deliver, The Villager on January 14, 2013 by southvillageneighbors.